What Is My Dog Thinking – Why Dogs Eat Grass? Why do dogs eat grass? Dogs are descendants of wolves and are carnivores by nature. In the wild, when a wolf kills a deer, moose or any other herbivore – the first thing they do is tear into the stomach. Then wolf will then consume not only the flesh but also the vegetable matter in the various states of digestion. That is why dog’s desire an occasional “salad”. It could be the texture, it could be the taste — we really don’t know. That is why dogs eat grass. The issue is that our dog’s digestive systems are not equipped to handle the vegetable matter (grass) that is not pre-digested like their ancestors. This is the reason most dogs will vomit after eating grass. 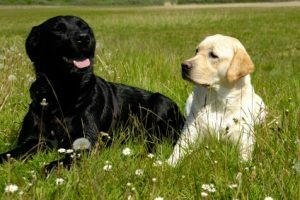 Interestingly, if a dog is suffering from an upset stomach, they will instinctively eat grass in order to induce vomiting – hoping to expel whatever is ailing them.